Home » Blog » Is Cleaning Gutter Guards Useful or a Big Waste of Time? Gutter guards are a fantastic invention for reducing the amount of debris that can enter and create clogs in your gutters. But, what happens when you need to do your regular gutter cleaning? Is cleaning gutter guards recommended or even possible? 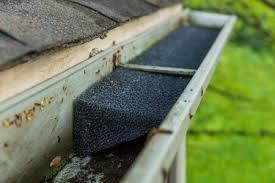 I want to go over some of the basics about how to clean gutter guards and when it’s important. 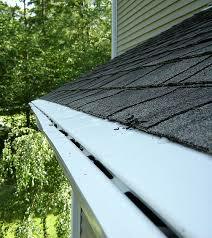 Do Gutter Guards Need Cleaning? First, let’s address the elephant in the room (or, in this case, on the roof! ): yes, gutter guards will need cleaning, just as your gutters will still need cleaning. Guards are great, but they can’t fully block everything that normally goes into the gutters, especially the smaller dirt and debris. Based on the type of gutter guards your house has, you can get by with the normal twice yearly routine, once in the fall and again in the spring. Read: Leaf Guards, Do they really work? However, each gutter guard system is going to have different needs and cleaning methods! This is vital to know before you even install the guards, but definitely before you plan on cleaning them. When it comes to maintenance, brush guards are the absolute worst. Leaves and organic materials don’t just bounce off the guards and fall to the ground. 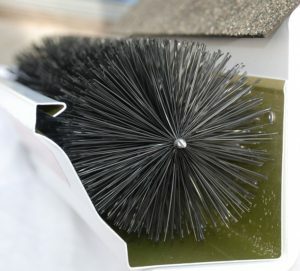 In the case of brush guards, much of this debris becomes caught in the brush itself and eventually works down to the middle or bottom of the gutters, causing a large clog. You are going to have to clean these regularly if you have a lot of leaves and organic matter coming into your gutters normally. They should be easy to lift and clean underneath while you clean the gutters themselves. Probably the easiest to clean, mesh guards can usually be lifted up to uncover what’s beneath them and give it all a good cleaning. You shouldn’t have any trouble replacing them to their normal position after the cleaning is finished. Covers may be the most difficult type of gutter guards to clean, because they are usually installed securely. This installation helps them stay on through thick and thin, but it doesn’t make a good case for cleaning. If you have gutter covers, it might be a good idea to call in a professional gutter cleaning company to get the job done right, so that you don’t risk breaking your covers. Like brush guards, foam gutter guards can collect quite a mess over time, as leaves and debris get around the edges and underneath the foam. You should be able to lift the foam and clean as you go along, without having to remove any large pieces at any point. Gutter guards are very useful for protecting your home from water damage, pests, and a plethora of other problems. But, they will need to be cleaned out, even though less debris will be getting into the gutters themselves. Cleaning gutter guards is a necessary part of your home maintenance, so don’t forget to get it done!